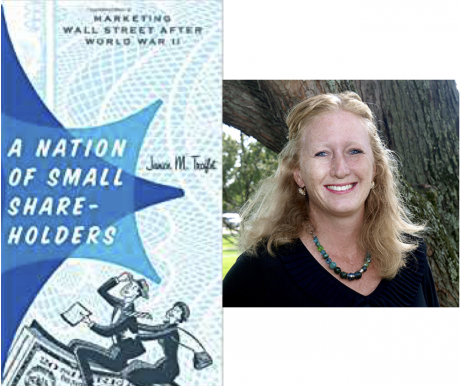 A Nation of Small Shareholders: Marketing Wall Street after World War II (Studies in Industry and Society) by Janice M. Traflet (link to buy) explains how an ad campaign began to transform American finance. With all the current focus on Main Street investors, A Nation of Small Shareholders could be revisited and transformed to include more Americans in a dynamic capitalism that embraces the values of American citizens. Main Street investors, and their willingness to commit hard-earned money to capital markets for the long term, have ensured he U.S. capital markets are the deepest, most dynamic and most liquid in the world. Are Clayton’s remarks genuine or intended to provide cover for repealing protections? How does replacing Obama’s fiduciary rule with “best interest” requirements based on increased disclosures put Main Street investors first? Are retail investors likely to read or understand the disclosures? in 1950 retail investors directly owned more than 90 percent of the stocks issued by U.S. companies. Today, that number is closer to 30 percent, with securities markets these days increasingly being dominated by big, institutional and often passive holders. The Coalition says it is aimed at helping individual investors influence the decisions funds make on their behalf. However, some have questioned the Coalition’s objectives and the validity of their claim to stand for retail investors. (The Main Street Investors Coalition is an Industry-Funded Effort to Cut Off Shareholder Oversight). While we welcome attention on Main Street investors, neither the Coalition or the SEC focus on increasing the number of retail shareholders or empowering them in a meaningful way. Traflet’s A Nation of Small Shareholders has little to say about empowering small shareholders on issues of corporate governance. Her focus is on how and why the New York Stock Exchange (NYSE) helped increase the proportion of Americans who are shareholders. That experiment is worth repeating on a deeper level that not only gives retail shareholders a sense of participating in capitalism but empowers them to change the course of capitalism. While the American way of life is no longer threatened by communism, our social divisions are aggravated by the fact that 80% of equities are owned by 20% of the population. Even if the “average” American received 40% of their income from investments, that would mean very little to our collective economic well-being. Since the median (typical) American has virtually no such investments, they would also fail to gain from income generated by investments. Of every dollar paid out to CalPERS members, 61 cents comes from investment earnings. Imagine a world where 60% of your income came from investment earnings your whole life. I would guess we would pay close attention to how those funds are invested. We would also be more likely to recognize the importance of how corporations are governed and how our proxies are voted. Since only the richest Americans currently earn the bulk of their earning through investments, most of us do not typically ponder the importance of aligning corporate behavior with our values. As Thomas Piketty has warned, investment income accelerates at a faster pace than wages. If current trends continue, stagnating income will continue as the norm for most, while a small few will reap the ever increasing benefits of capitalism. Some in the top 20% would argue there is nothing to worry about. The bottom 50% is powerless. Unions, a primary tool of the working class, have declined from 33% of the population to 10%. With the recent Janus decision, we can expect even that to drop. Maybe higher wealth individuals think they will benefit from growing inequality because it will be less expensive to hire someone to clean their house or mow their yard. However, clearly some are worried. Read Survival of the Richest. In the 1920s, immediately before the Great Depression, about 15-20% of households owned some stock. During WWII, the Treasury Department used the slogan “Own a Share in America” to promote the sale of war bonds. The New York Stock Exchange (NYSE) participated and gained valuable experience with advertising. After the War, a consensus of the NYSE board believed shareowners would be more invested in capitalism and more loyal to America and American companies than average Americans. Similarly, executives at AT&T wanted the company to be known as an “investment democracy,” rather than a monopoly. The NYSE developed a marketing campaign, “Own Your Share of American Business” (OYS), to rebuff communism and restore profitability to retail brokerage firms. Workers owning the means of production was embraced if done through the market, not the State. Additionally, NYSE wanted to be seen as operating in the public interest. Shareholders also vote and shareholders would be more likely to favor policies NYSE members favored, like lower capital gains taxes. In 1952 9.5% of American families owned stock. Of those who did, 72% owned stocks in three or fewer issuers. Retail accounted for 80% of trading volume and 94% of outstanding equities. In 1953 NYSE launched their OYS campaign. It was also dubbed “People’s Capitalism” and “Democratic Capitalism.” In 1954 a “Monthly Investment Plan” was developed as a way to invest small amounts with lower transaction fees, similar to modern DRIP investment plans. A 1954 poll found only 1/4 of adults knew the purpose of the NYSE was to raise capital, provide liquidity and create a fair and orderly marketplace. Many thought the NYSE actually set the price of stocks and bonds. NYSE marketing targeted women for their influence on their husbands, portraying equity investing as a family activity. By 1962 they began targeting women as investors, realizing women were actually investing on their own. The OYS campaign did have an impact. The percent of the population with equity investments more than doubled in the 10 years between 1952 and 1962. The demise of OYS was partially attributable to the paperwork crisis on Wall Street that eventually led to a shift from share certificates to virtual shares registered to the Depository Trust & Clearing Corporation. Brokers could not keep up with the paperwork of shareholders paying full commission. There was little point in attracting micro-investors. Additionally, mutual funds attracted more of the money. People became convinced that investing required the skill of a professional. In 1961 retail accounted for 61% of dollar trading volume on the NYSE; by 1974 that slipped to 30%. In the 1970s the NYSE was no longer bastion against communism. Instead advertising was aimed at upper income people. In 1979 Business Week declared 7 million investors had left since 1970. They came back but through funds, instead of direct investments. The first index fund began in 1975. Whereas in 1950s, investor bought and held for decades, by 2004 average holding period was 6 months. For a discussion of how those shifts impact us, see Review: What They Do With Your Money. OYS helped Americans overcome fear of the stock market, a legacy of the Great Depression. The architects of OYS team viewed stocks as a means of preserving the American way of life — the free enterprise system — capitalism. In the Own Your Share years the Big Board strove to make the process of buying stocks easy and unintimidating to average Americans — men, women, and children alike. Importantly, Keith Funston, Rud Lawrence, and the fellow architects of OYS (the longest marketing campaign in Exchange history) also sought to create a nation of “sound,” well-informed investors who understood the potential risks, as well as the rewards of share ownership. OYS was never aimed at really transforming America by shifting power from the few to the many. Giving small retail shareholders a “sense” of participating in capitalism was enough. Imagine, instead, if all Americans earned or had been given a substantive stake, as well as a meaningful voice in how corporations are governed and corporate resources are deployed. Imagine if investing in stocks was promoted as a way to endorse the value of earning not only a financial return but as a way to vote on what kind of world we want to live in based on each company’s “social purpose.” A Nation of Small Shareholders could be a nation of citizens more fully involved in directing corporations. More democratic forms of capitalism can still emerge. However, it becomes increasingly difficult to envision a true nation of small shareholders as wealth becomes more concentrated, taxes on the rich are lowered, unions lose rights, and companies use perpetual dual class share structures. Change is needed. Creating a nation of small shareholders involved in corporate governance would be transformative. As little context might be helpful. In 1950 the CEO to worker pay ratio was 20:1. The current ratio is closer to 300:1 http://fortune.com/2018/08/16/ceo-salary-pay-workers-gap/. I think it is safe to say that in the 1950s, people in the financial sector wanted Americans to feel like participants in the capitalist system, to avoid further restraints on the “free” market. That appears to be less of the case today with stock exchanges even allowing IPOs with dual-class and nonvoting shares. Even though half of Americans have no stocks or mutual funds, the finance sector was able to get bailed out in the Great Recession and appears not to need Americans to even feel like they have a stake in owning corporations.